January 6, 2010 - General Lew Allen Jr., the 10th chief of staff of the Air Force, passed away January 4, 2010, in Potomac Falls, Va. Funeral arrangements have not yet been made but burial will be in Arlington Cemetery. General Allen, a West Point graduate, entered the Air Force in 1946 and completed multi-engine flight training in November 1946. He flew bombers at Carswell Air Force Base, Texas, until he entered the master's program at the University of Illinois in 1950. In 1952 he received a Master of Science degree in nuclear physics and went on to earn a doctorate in physics in 1954. He spent the next 19 years working in the scientific community, involved with some of the nation's most sensitive space projects. For that work he was inducted into the Air Force Space and Missile Pioneers Hall of Fame Aug. 8, 2007, at Peterson AFB, Colo.
On his way to becoming the chief of staff of the Air Force, General Allen held a number of intelligence positions including director of the National Security Agency, chief of the Central Security Service and commander of Air Force Systems Command. He was appointed chief of staff in July 1978. 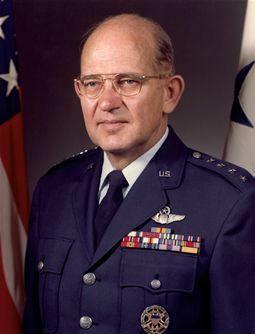 During his tenure, he oversaw the establishment of Air Force Space Command. Following his retirement in July 1982, he became director of the Jet Propulsion Laboratory National Aeronautics and Space Administration center in Pasadena, Calif., and remained in that position until 1990. Gen. Lew Allen Jr., the 10th chief of staff of the Air Force, passed away Jan. 4 in Potomac Falls, Va.
An award has been established in his honor that is presented annually to a base-level officer and senior NCO in aircraft, munitions or missile maintenance directly involved in aircraft sortie generation. According to officials, the award was established as a tribute to General Allen's legacy of attention to detail and technical expertise, attributes reflected in the nominees honored with the award bearing his name. After completing multiengine flight training in November 1946, General Allen was assigned to Strategic Air Command's 7th Bombardment Group at Carswell Air Force Base, Texas, where he flew B-29 Superfortresses and Convair B-36s, and also served in various positions related to nuclear weaponry. He attended the Air Tactical Course at Tyndall Air Force Base, Florida, and returned to Carswell Air Force Base as an instructor and assistant special weapons officer for the 7th Bombardment Wing. From June 1957 to December 1961, General Allen was assigned to Kirtland Air Force Base, New Mexico, as science adviser to the Physics Division of the Air Force Special Weapons Center. He specialized in the military effects of high altitude nuclear explosions and participated in several weapon test series. He was scientific director of a major experiment that utilized a large series of high altitude rockets to measure the characteristics of electrons trapped in the geomagnetic field after an exoatmospheric nuclear burst. After serving briefly as chief of staff for Air Force Systems Command at Andrews Air Force Base, Maryland, General Allen was appointed in March 1973 as deputy to the Director of Central Intelligence for the Intelligence Community in Washington, D.C. In August 1973, he became director, National Security Agency and chief, Central Security Service at Fort George G. Meade, Maryland. Allen's tenure as NSA director was noteworthy in that he became the first NSA director to ever testify publicly before Congress. In August 1977, he was named commander of Air Force Systems Command. Following retirement from the Air Force in 1982, he became the Director of Jet Propulsion Laboratory, during the Voyager program, serving in that capacity until 1990. He is a member of the National Academy of Engineering and the Council on Foreign Relations. From 1993 to 1995, General Allen served as a member of the President's Foreign Intelligence Advisory Board (PFIAB) and the Intelligence Oversight Board. Allen was awarded the 1999 Distinguished Graduate Award of the Association of Graduates, the alumni association of West Point graduates.